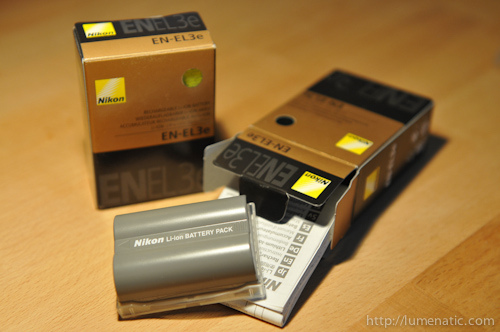 I got two additional original Nikon batteries. This alone is not worth a post, so I would like to reference to a very early post on this blog. I experienced an annoying effect when using third party batteries with the MB-D10 battery grip. The effect only occurs when the third party battery is in the grip and the camera is set to “use the internal battery first, then the one in the grip”. When you are checking pictures or browse the camera menu, the screen goes blank and the menu is exited. This is quite disturbing when you want to check your shots and the viewing mode is exited every two pictures. With any other setting (e.g. third party battery in the grip) the problem does not persist. Also I would like to point out that I did not perceive any major differences in battery lifetime – the Nikon and the third party products performed equally well (“perceived” meaning that I never tracked or measured this in detail. It is just that I never had the feeling like “oh, that third party battery is already empty ? ?”).